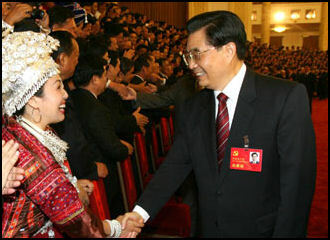 Hu Jintao pressing the flesh Chinese-style The Communist Party lacks rules for decision-making and even titles sometimes have little meaning. There are few rules and when there are rules they are often not followed. Personalities are generally of greater importance than policies. Seniority also seems to be important with former leaders and party elders often wielding their power behind the scenes. Things always tend to get interesting in China before a National People’s Congress, where leaders are anointed and the results of backroom maneuvering are on display. A great deal of time is taken up by sitting through lengthy meetings which accomplish little and sifting through lengthy documents and paperwork that are largely waste time. 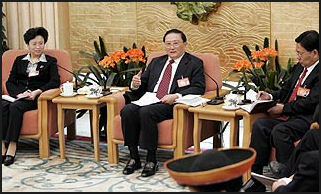 In 2007, the State Council set limits on the lengths of official meetings, speeches and documents. China has a top heavy approach to decision making, requiring layers of approval before a decision is made. Government workers are not elected and often feel little pressure to respond to public concerns. Dissent mostly takes the`of “petitioning the court,” a practice that dates back to dynastic times. "China's philosophy is to do things gradually because they don't like dramatic change," Li Jie, head of the Reserves Research Institute at the Central University of Finance and Economics in Beijing, told the Los Angeles Times. "We have a saying: 'You don't cry until you see the coffin.' They don't have an incentive to change the status quo." 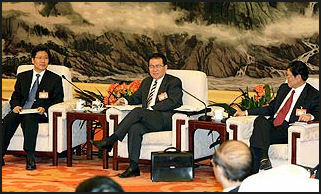 Meeting with Premier Wen Jiabao Chinese Party politicians portray themselves as serious and loyal to the party. At party meetings they are shown lined up in rows, dressed in the same dark Western suits, clapping in unison to speeches by their leaders, with individuality occasionally expressed with oversized glasses or slightly permed hair. They tend to give away little about their personalities, their personal and private lives, and their views on policy matters. Every leader at virtually every level has to be appointed, approved or otherwise sanctioned by the Communist Party. Under ancient Chinese system of patronage, which is still followed today, officials received appointments from above in return for remuneration from below. And people who collected taxes and other payments kept some for themselves and passed on the rest to their superiors. Promising new members are generally recruited in the cities not the countryside. Minxin Pai of the Carnegie Endowment for International Peace said, “the party showers the urban intelligentsia, professional and private entrepreneurs with economic perks, professional honors and political access." The career of ambitious Communist officials is not unlike that of officers in the American military. Ambitious young officials are rotated through a series of management posts, punctuated with mid-career training at party schools. They are evaluated at the end of each command post, which determines whether they advance or are sidetracked. 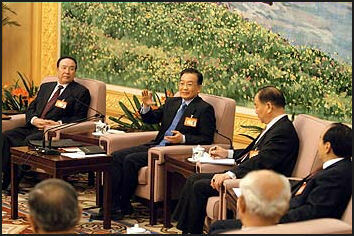 Meeting with Wen Jiabao and Vice Premier Wu Yi The goal for ambitious politicians and officials is to win a place on the Central Committee, with this leading to a governorship of a province or a post as a regional party secretary, with the aim of ultimately making it to the Politburo. Dutch journalist Willen van Kemendade wrote in his book China, Hong Kong, Taiwan, Inc., the central authorities "most effective instrument" is "the power to appoint and dismiss governors, party secretaries and regional army commanders." In some ways, modern Chinese politics is governed by some of the same unwritten laws that legitimized China's dynasties and emperors. The most important of these is the "Mandate of Heaven," the sacred relationship between the people and the ruler ordained by the forces of "heaven." If the ruler somehow violates this sacred relationship through corruption or violence the "mandate" to rule can be taken away resulting in the collapse or a dynasty or government. The selection of members and positions, the shaping of policy and the making of decisions in the shadowy, mysterious world of the upper ranks of the Communists party is little understood by outsiders but is thought to be characterized by alliance building, political purges, maneuvering against rivals and powers shifts among individuals. According to the Economist, "Communist Party officials function as a ruling class. They are a self-selected group accountable to nobody. They oversee government and industry, courts and parliaments. Elections are allowed for 'people's congresses'’so long as the party does not object to the contestants...A party committee keeps watch within every institution of government at every level. The system was copied from the Communist Party of the Soviet Union, but expanded in translation." Leaders seem to be picked in behind-the-scenes horse-trading session of which few details are known to outsiders. Decisions are worked out before they are brought before the legislature where they are approved in carefully scripted legislative elections. Pie Minxon, a Princeton University professor, told the Washington Post, "Chinese leaders are chosen because of their personal connections and relationships with their superiors, or on their technical training or background. Few leaders are chosen for their ability to communicate with ordinary Chinese people." Fang Lizhi wrote in the New York Review of Books, “The top leaders in the Communist system are selected through processes of competition among elite interest groups and have little to do with Chinese people who are outside those circles. It should not surprise us, therefore, that the leaders who rise to the top are focused intensely on the political and economic interests of the power elite. We cannot expect that leaders selected in this way will feel concern for ordinary people, or for what is best for China as a whole. The death of Communist Party leader has traditionally been a big deal. The government decides when life support systems are shut off and organizes the burial and memorial service and statements about his legacy. The death of some leaders have been catalysts for reform and dissent. The Tiananmen Square protests were prompted by death of the reformist leader Hu Yaobang. Large protests also occurred after Zhou Enlai died. Meeting with potential future leader Luo Gan Potential future leaders stake out a position by 1) putting their allies in key positions in important departments in Beijing and among party leaders in the provinces; 2) engaging in high-profile, highly-publicized activities such as meeting with international leaders; and 3) making friends in the military. Young members considered promising are given tough, responsible positions to evaluate their party loyalty, leadership skills, decision-making and ability to get things done. Potential leaders are placed in high positions as test of their competence and skill. Even though loyalty and not making trouble are greatly valued, a leader usually has to show skill in handling a crisis or offering some ideas to make an impression and stand out above rivals. Public opinion is often as crucial to judging the success in these matters as approval within the party. Among the high positions that are seen as stepping stones politburo membership and even President os the party Secretaries of Shanghai and Tibet. Hu Jintao cut his teeth as Party Secretary in Tibet. 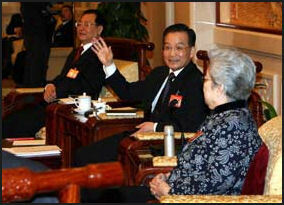 Jiang Zemin was Party Secretary in Shanghai. Key to rising through the system is not making any mistakes or offending anyone. The No. 2 men in particular have had a hard time exerting themselves without being purged. Book: The Party, the Secretive World of China’s Communist Rulers by Richard McGregor (Harper 2009). One of the more destabilizing forces in China comes from fights within the Communist Party, most often between conservatives and reformers. In recent years there has been some struggles between supporters of market reforms and this who support traditional Communist beliefs. Feuds over ideological points are often really power struggles by the parties that advocate the ideologies. The struggles often appear to be propaganda battles but in reality they are clashes between personalities. Sometimes the struggles are quite subtle and understated, with rivals bending over backwards not to say anything in public that is confrontational lest they be interpreted as being overly pushy or aggressive. Sometimes the most aggressive battles are fought by supporters of different powerful politicians whose jobs and livelihoods are dependent on those politicians. Which way the wind is blowing is often played out by how key aids of important leaders are treated. “Last week, I spent time with a well-regarded Chinese scholar at Peking University who explained, in vivid terms, why he believes that special interests such as state-owned companies are “hijacking the government.” “I have a classmate from college who is now a billionaire,” he said, “and another classmate working in the government. And the billionaire classmate at one time wanted to get my government-official classmate to be a vice mayor in some city because my billionaire classmate had a project in that city. And this is actually very common in China. It’s actually not illegal because my billionaire classmate knows the Party secretary in that city very well. So he can persuade the Party secretary to do that. As outsiders, you don’t know this. You think it’s the party secretary’s decision. But my billionaire classmate is behind this.” In other words, if you want to prevent the next crisis with Japan from becoming something far larger and more dangerous, it will mean figuring out how to keep China’s power-players from being more powerful than their own system. The Chinese Party still tries to control all social organizations. Even so an increasing number of grassroots groups are springing to address a range of issues such as the environment, abandoned children, AIDS, domestic violence and the preservation of Chinese architecture. The government welcomes some of these groups because they provide services the government has not been able to provide since the end of the iron rice bowl welfare system. But there are also worries these groups might threaten the party’s lock on power. The government has tried exerting its control by sponsoring its own organizations, limiting the number of people that can join existing groups and requiring groups to have government sponsors. In some cases authorities have shut down organization as benign as a school for children with AIDS because they were viewed as threats. Allowing migrant workers to serve as deputies in local people’s congresses is seen a sign that Beijing is being responsive to grassroots needs. Parents group such as those that lost children in the Sichuan earthquake and Tiananmen Square and those whose children were sickened in the tainted milk scandal have been allowed to organize and operate relatively freely in part because these groups have the sympathy of the general public and to crackdown on them could cause widespread resentment among ordinary people who have become increasingly well-informed and connected in the Internet age. These parents groups are among the first groups that have been allowed to operate beyond the control of the government. The government has tried to clamp down on such groups by following and tracing the calls of leaders and closing and blocking their websites but been outwitted by leaders who communicate with card cell phone that can’t be traced and meet and statehouses and communicate through websites that have foreign sponsors and can’t be touched by Chinese censors. 1. That the personal and family wealth of all officials be publicized and their source clarified, and all "naked bureaucrats" be expelled from the Party and the government. (“Naked bureaucrats” refer to those officials whose family lives in developed countries and whose assets have been transferred abroad, leaving nothing but him/herself in China.) 2. That the National Congress concretely exercises its legislative and monitory function, comprehensively review the economic policies implemented by the state council, and defend our national economic security. 3. That the existing pension plans be consolidated and retirees be treated equally regardless of sector and rank. 4. That elementary and secondary education be provided free of charge throughout the country; compensation for rural teachers be substantially raised and educational resources be allocated on equal terms across urban and rural areas; and the state assume the responsibility of raising and educating vagrant youth. 5. That the charges of higher education be lowered, and public higher education gradually become fully public-funded and free of charge. 6. That the proportion of state expenditure on education be increased to and beyond international average level. 7. That the price and charge of basic and critical medicines and medical services be managed by the state in an open and planned manner; the price of all medical services and medicines should be determined and enforced by the state in view of social demand and actual cost of production. 8. That heavy progressive real estate taxes be levied on owners of two or more residential housings, so as to alleviate severe financial inequality and improve housing availability. 9. That a nation-wide anti-corruption online platform be established, where all PRC citizens may file report or grievance on corruption or abuse instances; the state should investigate in openly accountable manner and promptly publicized the result. 10. That the state of national resources and environmental security be comprehensively assessed, exports of rare, strategic minerals be immediately cut down and soon stopped, and reserve of various strategic materials be established. 11. That we pursue a self-reliant approach to economic development; any policy that serves foreign capitalists at the cost of the interest of Chinese working class should be abolished. 12. That labor laws be concretely implemented, sweatshops be thoroughly investigated; enterprises with arrears of wage, illegal use of labor, or detrimental working condition should be closed down if they fail to meet legal requirements even after lawfully limited term for self-correction. 13. That the coal industry be nationalized across the board, all coal mine workers receive the same level of compensation as state-owned enterprise mine workers do, and enjoy paid vacation and state-funded medical service. 14. That the personal and family wealth of managerial personnel in state-owned enterprises be publicized; the compensation of such personnel should be determined by the corresponding level of people's congress. 15. That all governmental overhead expenses be restricted; purchase of automobile with state fund be restricted; all unnecessary traveling in the name of "research abroad" be suspended. 16. That the losses of public assets during the "reforms" be thoroughly traced, responsible personnel be investigated, and those guilty of stealing public properties be apprehended and openly tried. Although official documentaries by the state broadcaster have celebrated his life, Zhou's actual position is more precarious. In the late 1960s, he was branded a reactionary and sent to a labor camp for two years. In 1985, he translated the Encyclopaedia Britannica into Chinese and then worked on the second edition---placing him in a position to notice the U-turns in China's official line. At the time of the original translation, China's position was that the U.S. started the Korean War---but the encyclopedia said North Korea was to blame, Zhou recalls. "That was troublesome, so we didn't include that bit. Later, the Chinese view changed. So we got permission from above to include it. That shows there's progress in China," he says, adding, "But it's too slow." At 105, Zhou calls it as he sees it without fear or favor. He's outspoken about what he believes is the need for democracy in China. And he says he hopes to live long enough to see China change its position on the Tiananmen Square killings in 1989. "June 4th made Deng Xiaoping ruin his own reputation," he says. "Because of reform and opening up, he was a truly outstanding politician. But June 4th ruined his political reputation." Far from shying from controversy, Zhou appears to relish it, chuckling as he admits, "I really like people cursing me." That fortitude is fortunate, since his son, Zhou Xiaoping, who monitors online reaction to his father's blog posts, has noted that censors quickly delete any praise, leaving only criticism. The elder Zhou believes China needs political reform, and soon. "Ordinary people no longer believe in the Communist Party any more," he says. "The vast majority of Chinese intellectuals advocate democracy. Look at the Arab Spring. People ask me if there's hope for China. I'm an optimist. I didn't even lose hope during the Japanese occupation and World War II. China cannot not get closer to the rest of the world." The elderly economist is scathing about China's economic miracle, denying that it is a miracle at all: "If you talk about GDP per capita, ours is one-tenth of Taiwan's. We're very poor." Instead, he points out that decades of high-speed growth have exacted a high price from China's people: "Wages couldn't be lower, the environment is also ruined, so the cost is very high." Zhou's century as a witness to China's changes, and a participant in them, has led him to believe that China has become "a cultural wasteland." He's critical of the Communist Party for attacking traditional Chinese culture when it came into power in 1949, but leaving nothing in the void. He becomes animated as talk turns to a statue of Confucius that was first placed near Tiananmen Square earlier this year, then removed. "Why aren't they bringing out statues of Marx and Chairman Mao? Marx and Mao can't hold their ground, so they brought out Confucius. Why did they take it away? This shows the battles over Chinese culture. Mao was 100 percent opposed to Confucius, but nowadays Confucius' influence is much stronger than Marx's," he says. One final story illustrates Zhou's unusual position. A couple of years ago, he was invited to an important reception. At the last minute, he was told to stay away. The reason he was given was the weather. But his family believes another explanation: One of the nine men who run China, a member of the Politburo Standing Committee, was at the event. And that leader did not want to have to acknowledge Zhou, and so give currency to his political views. That a Chinese leader should refuse to meet Zhou is telling, both of his influence and of the political establishment's fear of one old man.